Powerhouse schools such as Marian College and various Colorado schools brought loaded teams to northern Utah for three days of racing from May 3-5, 2013 as stars and stripes jerseys were awarded to numerous athletes. Marian’s Kaitlin Antonneau recorded another dominating performance. The Exergy/2016 rider captured her third consecutive Division I omnium title while teammate and classmate Coryn Rivera was second. Antoneau beat Rivera in a sprint at the line for the road race title, was second to Rivera in the criterium and was part of an overwhelmingly dominant team time trial championship. In all, Antonneau was virtually unstoppable as she wrapped up her collegiate career. The road race victory on May 5 was difficult with all racers leaving nothing in the tank, but Antoneau and Rivera were simply too strong at the finish line. On the men’s side, Marian was also unbeatable in the omnium with Adam Leibovitz taking top honors over Fort Lewis College’s Renan Maia. In the team omnium competition, which combined men’s and women’s results, Marian scored an overwhelming 553 points with Colorado-Boulder checking at second with 417 and Fort Lewis College third at 345. 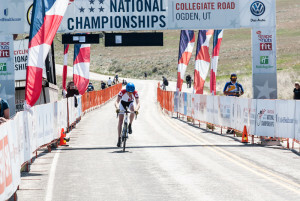 Utah schools had a strong contingent of racers and posted some solid results. Mitchell Peterson of the University of Utah, a pro mountain biker, cranked out an incredible individual time trial to take third place in the Division I results with a time of 28:48.05 – 1:32.11 back of Lees-McCrae College’s Spencer Oswald. Teal Buchi of Utah Valley University was 21st in the individual time trial. Buchi placed 28th in the Division I criterium with Utah State’s Kodey Myers and Utah’s Scott Bauer placing 37th and 38th in a crowded field with 40 riders all within five seconds of the winner – Marian’s Colton Barrett. The women’s Division I crit was also a crowded competitive race with Utah State’s Joan Meiners just five seconds off Rivera’s winning pace, but had to settle for 30th overall as the field sprint was huge. 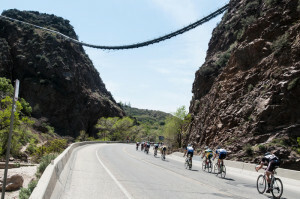 While Howard Grotts took the Division I road race title for Fort Lewis College in a solo breakaway, Buchi had a respectable 18th and Cortlan Brown, the 2012 Division II national champ, rolled across the line in 20th for the University of Utah. USU’s Myers was 23rd. For complete results, see usacycling.org.